Book Review of "I Will See You In Heaven" by Friar Jack Wintz. 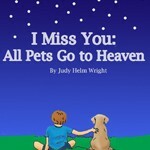 This powerful little book was given to us at the death of our beloved pet. 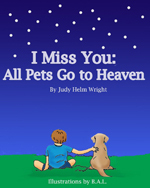 As an author of "I Miss You- Do Pets Go To Heaven" I get asked frequently, by both children and adults, about where our beloved pets go when they cross the Rainbow Bridge. It gives me great comfort to be able to reassure them that, indeed, we will be reunited with our beloved pets again. As a Franciscan friar for over fifty years, Jack Wintz has been deeply influenced by the stories of St.Francis of Assisi and his close relationship with animals.
" Some thirty years ago I came to the conclusion, which I've never abandoned, that St. Francis came to see that all creatures for one family of creation. Maybe that conclusion is obvious to you, but for me this idea dawned quite gradually. The conviction has grown stronger and stronger, and this book has grown out of that conviction and explores the implications of it. What would it mean if all creatures were one family? How would it affect us? How would it change our understanding of God, and how we relate to God and to each other?" You can find this book at most bookstores or order from Amazon. I am giving it five stars for beauty and message. PS: Children are drawn to animal stories because they relate to the pet. Help your child learn to read by sharing books and stories that hold their interest. See www.ArtichokePress.com for a list of books and eCourses. You will be glad you did.